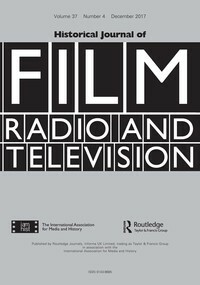 A special issue of the Historical Journal of Film, Radio and Television (Volume 37, Number 1, 2017) edited by Lez Cooke, John Hill and Billy Smart, has now appeared. The articles contained in this issue derive from our conference, ‘Television Drama: The Forgotten, the Lost and the Neglected’, which took place at Royal Holloway, University of London, 22-24 April 2015. The purpose of the conference was to investigate television dramas that might be regarded as ‘forgotten’, explore some of the reasons for this and assess the consequences of ‘forgottenness’ and critical neglect for both histories of British television drama and television drama more generally. The volume itself consists of seven articles which explore various aspects of lost, forgotten or critically neglected television drama. John Wyver writes about the career of one of the pioneers of early television drama, Fred O’Donovan, and assesses his ‘one camera’ technique. Lez Cooke writes about one of the earliest surviving recordings of TV drama, Anastasia (1953), which was originally shown as part of our ‘Television’s Neglected Plays’ season at BFI Southbank in 2015. Billy Smart looks at the BBC’s Television World Theatre series and the reasons it remains largely unknown while Stewart Anderson reappraises the West German adaptations of Francis Durbridge’s crime thrillers made mainly during the 1960s. John Hill discusses the plays of Dominic Behan (including some of those previously shown at the Belfast Film Festival) and assesses their significance for the history of television ‘troubles’ drama. Ian Greaves and John Williams consider the 26-part series Churchill’s People (1974-5) and analyse the reasons for its critical failure. David Rolinson investigates the banning of Alan Plater’s drama documentary The Black Pool, made for the BBC science documentary series Horizon, while Sally Shaw considers Michael Hastings’ 1979 television play, Gloo Joo, and an abandoned spin-off situation comedy series, Meadowlark (1982).